This article presents qualitative results of the first three years of the New Mexico Laptop Learning Initiative (NMLLI). Results suggest that teachers, students, and their communities support this initiative to improve student learning. Descriptive statistics were used during year two to further understand how the laptops were being used by students. During year three of this study, in-depth interviews/focus groups and observations were used at one school to add depth to understanding the NMLLI. Overall, Teachers report more creative, customized, collaborative lessons; students are more interested in school and focused on their work; parents have increased involvement with their student's education and communication with the school. Teachers also claim to have benefited from training and were interested in more in-depth support to advance their teaching with technology skills. Rutledge, D., Duran, J. & Carroll-Miranda, J. (2007). Three Years of the New Mexico Laptop Learning Initiative (NMLLI): Stumbling Toward Innovation. AACE Journal, 15 (4), 339-366. Chesapeake, VA: Association for the Advancement of Computing in Education (AACE). Retrieved April 20, 2019 from https://www.learntechlib.org/primary/p/23576/. Center for Applied Special Technology. (1996). The role of on-line commu-n ica t ions in schools: A national study. Retrieved October 23, 2003, from http://www.cast.org/ Cohen, M. , & Reil , M. (1989). The effect of distant audiences on students’ writing. American Educational Research Journal, 26 (2), 143-159. Creswell, J.W. (1998) Qualitative inquiry and research design: Choosing among five traditions. Newbury Park, CA: Sage. Freidman, T.L. (2005) The world is flat: A brief history of the 21st century. New York: Farrar, Straus, and Giroux. Gibson, S., & Oberg, D. (2004). Visions and realities of Internet use in schools: Canadian perspectives. 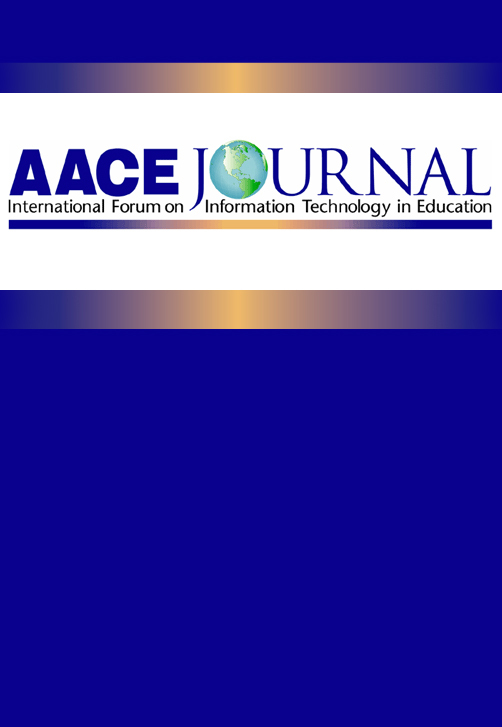 British Journal of Educational Technology, 35(5), 569-585. Honey, M., & Henriques, A. (1996). Union city interactive multimedia tr i-a l: 1993-95 summary report. CCT Report Issue No. 3. Retrieved October 23, 2003, from http://www.edc.org/CCT Keane, J.T. , Gersick , A. , Kim, C. , & Honey, M. (2003). Toward a sustainability framework: Lessons from the literature and the field. In N.
Maddux, C.D., Johnson, D.L., & Willis, J.W. (1997). Educational computing: Learning with tomorrow’s technologies (2nd ed.) Boston: A l lyn and Bacon. Meyen, E.L., & Bui, Y.N. (2003). Online academy: Content validation through a juror process. Journal of Technology and Teacher Education, 11(3), 443-454. Moore, M.A., & Karabenick, S.A. (1992). The effects of computer commu-n ica t ions on the reading and writing performance of fifth-grades tudents. Computers in Human Behavior, 8, 27-38. Olaniran, B.A. (1994). Group performance in computer-mediated and faceto-face communication media. Management and Communication Quarterly, 7(3), 256-281. Patton, M.Q. (1990). Qualitative evaluation and research methods (2nd ed). Newbury Park, CA: Sage. Seidman, I.E. (1997). Interviewing as qualitative research. New York: Teachers College Press. Silvernail, D.L., & Harris, W.J. (2003, March). The Maine learning technology initiative: Teacher, student, and school perspec t ives—M id-year evaluation report. Gorham, ME : Maine Educational Policy Research Institute. Spellings, M. (2006, February 9). On the role of education in global competitiveness. Testimony before the United States Senate Committee on Health, Education, Labor, and Pens ions 109 th Congress.